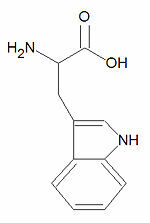 Tryptophan, the largest of the common amino acids. Trptophan, abbreviated Trp or W, is the largest of the twenty common -amino acids used by living organisms to build proteins. It is one of the four aromatic amino acids with histidine, phenylalanine and tyrosine. It is the most hydrophobic of the amino acids, and most well-folded proteins have one or more tryptophan residues at the center of hydrophobic patches. The large amount of tryptophan in turkey meat encourages drousiness at Thanksgiving. Both contaminated tryptophan, as well as high levels of pure tryptophan, have been associated with the eosinophilia-myalgia syndrome. This page was last modified 18:48, 5 August 2010.